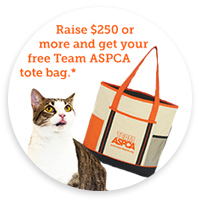 You don't need a special reason to join Team ASPCA! Create a campaign to honor the rock star pet in your life. Dedicating a Team ASPCA fundraising page to your pets is a wonderful way to celebrate the special animals in your life—and to give the gift of life to animals who are less fortunate. Create a personal fundraising page and share it with your family and friends. Maybe your pet is a rescue, and you want people to know their story? Or perhaps you would like to share a story about how your pet rescued you! You can personalize your page with your own message and pictures. Every dollar you raise through your page furthers the ASPCA’s groundbreaking work and help builds a more humane country for all animals.